There are dozens of reasons why I wish that every MMO that I dabbled in had a makeup system like Blue Mars has, and I've presented a lot of those reasons already: I've lauded the versatility of adding "gloss", the ability to apply real-life cosmetics techniques to avatar faces, and I've had a lot of fun styling my makeup in unique ways for certain outfits. 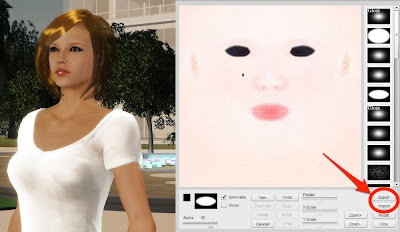 However, there's one feature I haven't mentioned until now that has the potential to really revolutionize how virtual fashionistas think about their avatar skins and makeup effects. 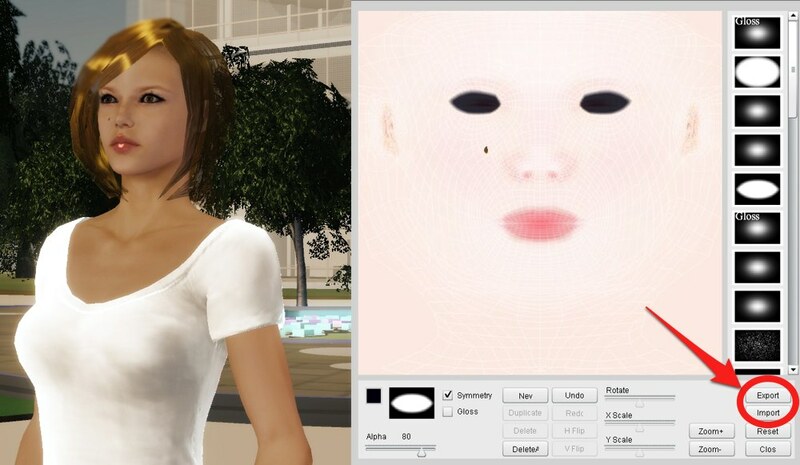 The Blue Mars Face Editor allows you to export and import makeup layers as .csd, or cosmetic, files. This is a form of content creation that you can do wherever you are in Blue Mars, on any type of account at all, which is particularly interesting if you, like me, find working with mesh a little bit over your head. This exporting functionality also means that makeup layers can be swapped around and shared within the community. Did you design a really cute Clara Bow-style pout? Send it to your friends! Did you make a really wicked looking scar? Upload it and share it over Twitter or Facebook! As a veteran virtual fashion blogger, I like the idea of attaching a download link if I've designed a particularly striking makeup element to go with an outfit, so the look can be recreated more accurately, and this is a feature I can definitely see myself taking advantage of in the future for that exact reason. With this in mind, I've exported one of my favorite makeup layers, a classic retro-style cat-eye in black which I wear with almost everything, and uploaded it to share. Click here to download it! Another advantage of this feature for makeup layer addicts like myself is that I can export the fancier layers that I don't wear as often into a folder on my computer, then just import them when I want to wear them, rather than having a jumble of transparent layers on my face all the time. It's a great window of organizational opportunity. Do you have a favorite makeup layer that you've designed in Blue Mars? Upload it and share!